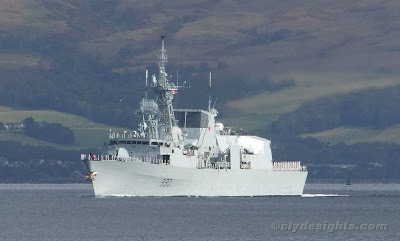 Seen passing the Ashton Buoy, the Canadian oiler PRESERVER was followed out by the British Type 23 frigate NORTHUMBERLAND, seen on her left above, which had left Faslane shortly before the Brazilian frigate DEFENSORA. 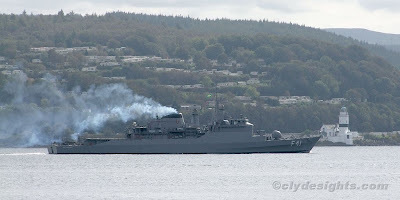 Making a considerable amount of smoke as she made her way towards the main Firth of Clyde channel, the Brazilian frigate DEFENSORA was caught passing Cloch Point. 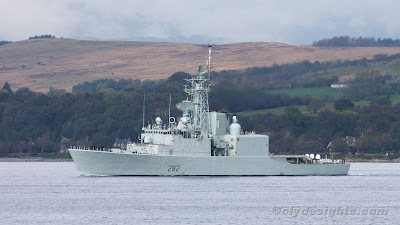 The first of the three Canadian ships to appear from their weekend berth at Glasgow was the frigate HALIFAX, seen here heading towards the Ashton Buoy. She was followed shortly afterwards by her sistership MONTREAL, seen heading downfirth with the Holy Isle prominent on the left. 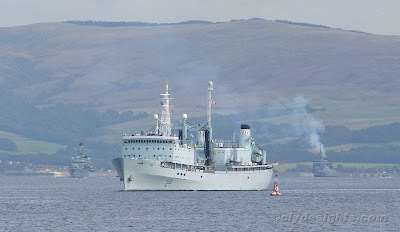 Last of the warships to sail was the Canadian destroyer ATHABASKAN. She is a member of the 'Iroquois' class and was launched as long ago as 1970, being commissioned two years later. 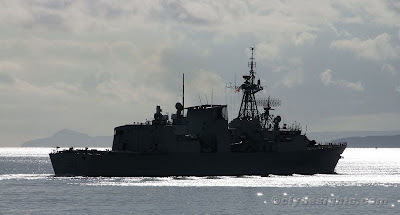 In the early 1990s, following duty in the Persian Gulf, ATHABASKAN underwent a major refit and was brought up to date with advanced anti-submarine, air defence, command and control capabilities. She is capable of operating two Sea King helicopters.